Kitagawa Utamaro (喜多川 歌麿, Kitagawa Utamaro) (ca. 1753 – 1806) (his name was archaically romanized as Outamaro) was a prolific Japanese printmaker and painter, and is considered one of the greatest artists of woodblock prints (ukiyo-e). His paintings depicted all the traditional subjects, portraits, landscapes and court scenes; he is known especially for his masterfully composed studies of women, known as bijinga. He also produced nature studies and illustrated books of insects. His paintings stood out above his contemporaries for their detail and design, and for the way in which they represented the elegance and prestige of his clients. Utamaro’s color prints were also exceptional. They were introduced to the Dutch community in Nagasaki, and when his work reached Europe during the mid-nineteenth century, it became very popular, especially in France. His works influenced the European Impressionists, particularly his use of partial views, with an emphasis on light and shade. Few biographical details are available for Utamaro, and each reference gives a substantially different account of his life. Various accounts claim that he was born in either Edo (present-day Tokyo), Kyoto, or Osaka (the three main cities of Japan), or a provincial town (no one is sure exactly which one) in around 1753; the exact date is also uncertain. Another long-standing tradition says that he was born the son of a tea-house owner in Yoshiwara, the courtesan district of Edo, but there is no evidence of this. His original name was Kitagawa Ichitaro. Utamaro went to Edo (Tokyo) around 1775, where he became a pupil of Toriyama Sekien, making his debut in the Ukiyo-e world under the pseudonym Toyoaki Kitagawa. It is generally agreed that he became a pupil of the painter Toriyama Sekien while he was still a child, and there are many authorities who believe that Utamaro was actually his son. He lived in Sekien's house while he was growing up, and the relationship continued until Sekien's death in 1788. Sekien was originally trained in the aristocratic Kano school of painting, but in middle age he began to lean toward the popular (or ukiyo-e) school. Sekien is known to have had a number of other pupils, none of who achieved any distinction. Utamaro, in common with other Japanese of the time, changed his name as he became mature, and also took the name Ichitaro Yusuke as he became older. He apparently also married; little is known about his wife, and it seems he had no children. His first major professional artistic work, produced in 1775 when he was about twenty-two years old, seems to have been the cover for a Kabuki playbook, under the gō (art-name) of Toyoaki. He then produced a number of actor and warrior prints, along with theatre programs and other such material. From the spring of 1781, he switched his gō to Utamaro, and started painting and designing mediocre woodblock prints of women. At some point in the middle 1780s, probably 1783, he went to live with the rising young publisher Tsutaya Juzaburo, with whom he apparently lived for about five years. In about 1791 Utamaro gave up designing prints for books and concentrated on making half-length portraits of single women, rather than the prints of women in groups favored by other ukiyo-e artists. He seems to have become a principal artist for the Tsutaya firm. His output of prints for the next few years was sporadic, as he produced mostly illustrations for books of kyoka, literally 'crazy verse', a parody of the classical waka form. None of his works from the period 1790-1792 have survived. 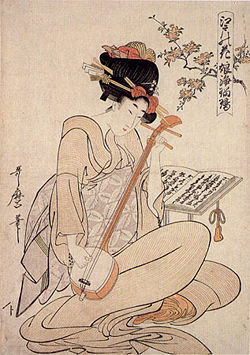 Utamaro’s early work was influenced by Torii Kiyonaga and Harunobu. 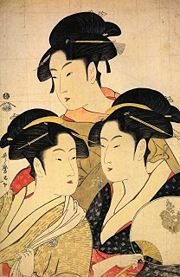 His models came from the street or from the Yoshiwara pleasure district, and there were numerous tales of his love affairs with the ladies of the “licensed quarters.” In 1793 Utamaro released a new series of prints of women which won him widespread recognition. Utamaro was said to have portrayed the beauty of women with more depth and sensitivity than any other ukiyo-e artist. He used new techniques which allowed him to achieve a different and softer effect with the flesh tones of his women. Now that he had become a recognized artist, Utamaro terminated his semi-exclusive arrangement with the publisher, Tsutaya Juzaburo (1793). He went on to produce a number of very famous series, all featuring women of the Yoshiwara district. The women in his portraits did not resemble the physiognomy of typical eighteenth-century Japanese women. They had extremely tall and slender bodies, heads that were twice as long as they were broad, very long noses and tiny slits for the eyes and mouth. Over the years, he also produced numerous volumes of nature studies and shunga, or erotica. In 1797, Tsutaya Juzaburo died, and Utamaro was apparently very upset by the loss of his long-time friend and supporter. Some critics feel that his work never again reached the same heights after the death of Tsutaya. In 1804 Utamaro got into serious trouble with the authorities over a historic scene he had published, showing the ruler Toyotomi Hiedyoshi with his wife and five concubines. This was regarded as an offense against the ruling Tokugawa shogunate, and he was briefly imprisoned. Some sources say that he was sentenced to wear handcuffs for fifty days, others say he was forced to wear an iron collar. This humiliation had a devastating effect on him; he fell into a deep depression and died in Edo two years later, in 1806, at the age of fifty-three. In spite of his suffering, Utamaro continued producing prints until his death. After Utamaro’s death, his pupil Koikawa Shuncho married his widow, took his master’s name and continued to produce prints of beautiful women in the style of his master until 1820. He used the same signature as Utamaro, causing considerable confusion for modern experts and collectors. It is estimated that Utamaro produced over 2,000 prints, and a number of paintings, surimono prints and illustrated books. In the late nineteenth century, large numbers of Japanese woodblock prints were imported to Europe. The Dutch dominated European commercial imports, and Dutch sailors had dominated the smuggling trade with Japan before Japanese ports opened to the West. The Dutch imported large numbers of ukiyo-e prints attributed to Kitagawa Utamaro; a few originals, many reproductions, many by Utamaro II and many fake copies. France was the chief market; the French loved his portraits of elegant women. As a result of these imports during the late nineteenth century, today France is a major source for Utamaro prints, reproductions and fakes. After Utamaro's death, his pupil Koikawa Shuncho continued to produce prints in his mentor's style, and took over the gō Utamaro until 1820; these are now referred to as the work of "Utamaro II." After 1820 he changed his gō to Kitagawa Tetsugoro, and produced his subsequent work under that name. Utamaro had several disciples, but his family situation was unclear. The famous contemporary author Takizawa Bakin wrote, “(Utamaro has) no wife and no children,” but because of the existence of a document recording the marriage of the second Utamaro to Utamaro’s widow, it is believed that he was married. Among Utamaro’s best known works are the series Ten Studies in Female Physiognomy; A Collection of Reigning Beauties; Great Love Themes of Classical Poetry (sometimes called Women in Love, containing individual prints such as Revealed Love and Pensive Love); and Twelve Hours in the Pleasure Quarters. Utamaro alone, of his contemporary ukiyo-e artists, achieved a national reputation during his lifetime. His sensuous female beauties are generally considered the finest and most evocative bijinga in all of ukiyo-e. He succeeded in capturing subtle aspects of personality, and the transient moods, of women of all classes, ages, and circumstances. His reputation has remained undiminished; his work is known worldwide, and he is generally regarded as one of the half-dozen greatest ukiyo-e artists of all time. Asano, Shugo, and Timothy Clark. The Passionate Art of Kitagawa Utamaro. British Museum Press, London, 1995. Hillier, Jack. Utamaro: Color Prints and Paintings. Phaidon, London, 1961. Kobayashi, Tadashi, and Mark A. Harbison (translator). Great Japanese Art: Utamaro. Kodansha, Tokyo, 1982. Narazaki, Muneshige, Sadao Kikuchi, and Bester John (translator). Masterworks of Ukiyo-E: Utamaro. Kodansha, Tokyo, 1968.